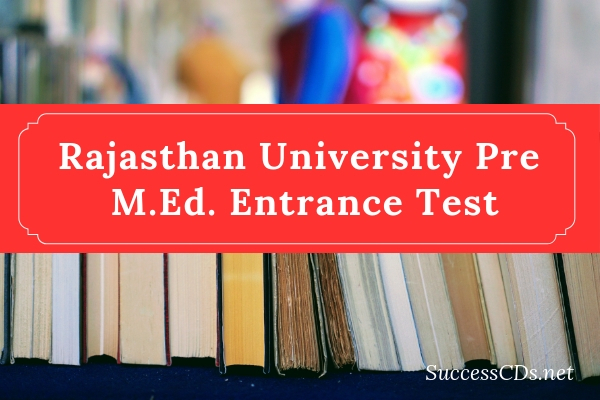 Rajasthan PMET 2019 Pre M.Ed Entrance Test - Rajasthan PMET 2019 is conducted by Rajasthan University. This exam is a state level entrance exam. It is conducted annually for candidates who wish to seek admission in the various M.Ed. courses offered by the Rajasthan University. Candidates are allocated seats on the basis of their performance in the Rajasthan PMET 2019 examination. Students who wish to appear can register themselves through the Rajasthan PMET 2019 Application Form. Candidates should enter all the authentic details in the application form because any discrepancy later noted by the officials will result in the disqualification of the candidate. There will be 50 questions in each section i.e. total 200 question in a question paper. All questions are in the form of MCQ. Total time period for PMET is 3 hours. Total Marks of the test is 600. There is no negative marking. The application form of Rajasthan University PMET 2019 is available only in the online mode. Candidates can fill their application form for Rajasthan PMET 2019 from the official website.